There are a number of risks involved with setting up computers at trade fairs or exhibitions. For example, clumsy visitors always manage to somehow crash a computer via a false click of the mouse or dubious software, and so damage the equipment beyond repair. Pengasurf enabled you to minimize these risks. There is also no additional inconvenience of installation or maintenance. 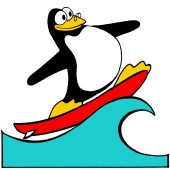 Tulix surft ... Pengasurf is specifically directed towards use at trade fairs and exhibitions. This computational configuration unfolds its advantages at every occasion where it is exposed to extreme customer contact. It involves an extremely robust system. Since one is only able to view pages in the internet, the visitor does not have any opportunity to carry out other applications. This is possible since Pengaway operates without disk drives or hard drives. All software is loaded from a CD, that is specially created for the computer in question. This CD may not be removed without the use of force whilst the system is in operation. Since the entire system is booted up from a CD, it is immune to any outside interference, as well as unintentional adjustments made by users. In case that sporadic crashes do arise, contrary to expectation, it is sufficient to switch the computer on and off again in order to transfer it into the "start" position. Pengaway was developed from a project that we carried out on behalf of the "Förderverein Kunst und Internet e. V.". This surf station was successfully used at an exhibition held by the Academy of Arts in Berlin. It is now outdated by all the available Live-Linux-systems which are easily adaptable to achieve the same.